But there are other versions of A Course in Miracles: an ‘urtext’ that consists mostly of unedited transcriptions of the divine messages dictated to Schucman, a version of the Course given to the son of Edgar Cayce and deposited in the archives of the Association for Research and Enlightenment, and another, curious version typed and bound in six black thesis binders that was photocopied and circulated in the summer of 1975. This latter version was described in testimony given by co-founder of the Foundation for Inner Peace Judith Skutch Whitson during a case involving copyright infringement on the Course. Skutch Whitson stated that she permitted the xeroxing, “and it seemed very right that people would pass it along, copy it over and copy it over, until finally people’s copies were getting so light that they couldn’t see them anymore.” This promiscuous sharing did seem appropriate for a book that encouraged its readers to experience the plenary nature of existence by giving in the name of the Holy Spirit, by recognizing that, “to spirit getting is meaningless and giving is all,” and that in giving, “all of it is still yours although all of it has been given away.” This expansive and emphatically optimistic understanding of the world is a guiding idea throughout the text, underpinning a spiritual process by which the individual ego is overcome and a complete and fulfilling union with God can be accomplished. This unofficial photocopied version was circulated before publication as a means to generate interest in a project that had theretofore been kept secret by Schucman and her co-editor William Thetford. On a trip to San Francisco, Skutch Whitson put copies in the hands of a number of people interested in new methods and modes of spiritual practice, including Dr. Edgar Mitchell, founder of the Institute of Noetic Sciences, researchers at the Stanford Research Institute who were working on parapsychological research and the limits of human potentiality, and others across the Bay area. These figures represented nodes in a distributed network of spiritual practitioners, people who could potentially turn A Course in Miracles from a tentative experiment in channeled authorship into a canonical text of contemporary spirituality. Separated by roughly thirty years, these two contrasting versions of A Course in Miracles—one professionally bound, elegant in design, authenticated by the original publisher and the other incomplete, passed from hand-to-hand, repeatedly copied—indicate two alternate visions of spirituality and the nature of contemporary religious organization. The first vouchsafes its religious legitimacy through rigorously controlled and highly centralized publication practices; the other generates its own organic authority by circulating in a non-centralized and informal network of readers, its movement constituting the very relationships that make up an interconnected spiritual community. The tension between these two visions—a tension between dissemination and control—has played out in the recent history of A Course in Miracles. Indeed, copyright litigation over different versions of the text has not only circumscribed the horizon of spiritual practices but also shaped the contours of the communities in which those practices take place. The question the court raised was a serious one and one that carries repercussions for the ways in which we conceive of organizations that arise around the self-conscious practice of spirituality. At what point does a distributed network of interested individuals cohere into an apprehensible group of like-minded followers, a united community of believers? For the many Americans who claim to be spiritual but not religious, how do they imagine their spiritual allegiances, their relationship to religious experience, their consumption of sacred texts? Are their actions simply tactics deployed in the service of individual self-improvement, self-exploration and therapy, or are they understood as being part of a shared set of practices among a community of like-minded seekers? 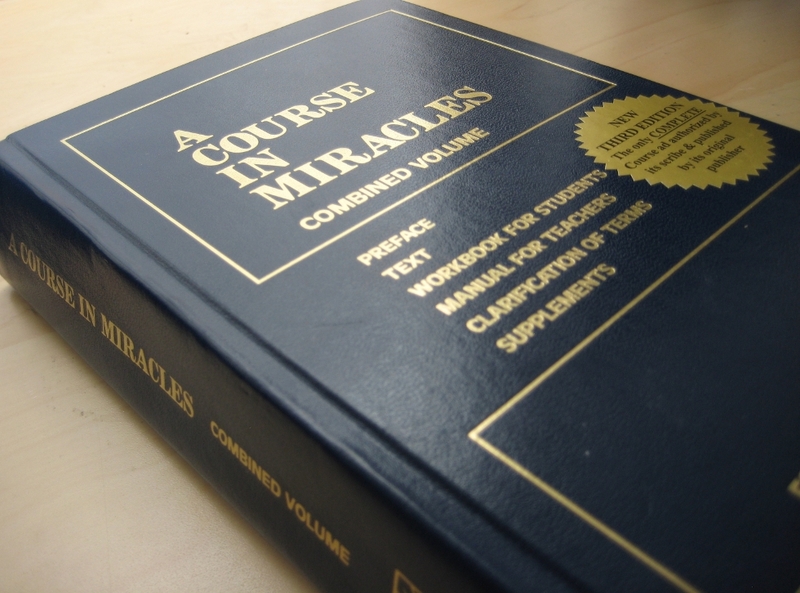 The issue with A Course in Miracles was that the early version of the text was not distributed to a predetermined group precisely because its circulation in the early stages of its existence was serving to constitute the group itself. The movement of the text between hands constituted the very mechanism by which a network of individuals could be linked together, who could then become visible to themselves as a unified community of followers. The Foundation—with regard to the fiduciary responsibility given to it—trusts in the fact that when Jesus directed Helen [Schucman] to perfect the copyright in A Course in Miracles, he intended that the Course be protected by copyright limitations within the ego framework. In effect, this ensures that the Course will remain intact and exactly as it was given, so that it will never be diluted, distorted, or changed. Jesseph thus presented a rationale that described the use of copyright as a necessary compromise with human law put in the service of divine warrant. Instead of explaining the foundation’s use of intellectual property rights as simply being in the service of economic and distributional efficiencies, Jesseph instead described it as a mechanism for the maintenance of a divinely sanctioned message. The content of A Course in Miracles was susceptible to distortion, alteration and misinterpretation by the corrupting practices of those outside the Foundation’s networks of circulation, thus legal recourse to prevent such distortion was an entirely appropriate, even spiritually motivated strategy. Jesseph’s justification does not conform to dominant understandings of copyright in the United States that usually depend either on a rationale grounded in the protection of the moral rights of [ostensibly human] authors or economic incentives designed to promote the production of creative goods. Nevertheless, he resurrected a sublimated theme within the law regarding intellectual property as intimately tied to questions of propriety. Foundation co-founder Kenneth Wapnick extended this logic even further in his statements after the case, describing the reading of current public domain versions of the Course (the urtext or the Cayce version) as a moral violation of the privacy of Schucman and Thetford, akin to listening in on a private conversation conducted between the scribes and Jesus and not yet reshaped into an official document destined for public consumption. So what are we to make of the role of intellectual property as a determinant of the nature and role of a spiritual text within a religious organization? For those who inhabit non-traditional, unchurched types of spiritual community, communities whose coherence lies not in a centralized space like the church but instead in the realm of literary works and other forms of shared religious media, intellectual property law may provide a uniquely effective means to reestablish a measure of control. By providing legal tools capable of administering the texts by which intrinsically ephemeral beliefs and practices are mediated, intellectual property law can help to establish official works and stabilize their religiously approved meaning while also permitting the patrol of the very channels of distribution that move those beliefs and practices between members of a newly articulated community. For those organizations that still market spirituality but distance themselves from traditional forms of religion, they may look to new mechanisms to assert a measure of authority and control over their product. And as the physical, sacred property of the church becomes less central to contemporary practice, so may the intangible and ephemeral, yet equally sacred intellectual property move to take its place.